When you think of robots, the first things that might come to mind are androids, like the ones in science fiction movies and TV shows such as “Star Wars” or “The Orville“. Or perhaps you envision industrial robots that build cars on assembly lines. Both of these sorts of real and sci-fi robots consist of many complex parts. They’re usually designed for a specific purpose. Now, researchers at MIT, Columbia University, Cornell University and Harvard University say they’re trying to rethink robotics, in a fundamental way. Toward that end, they’ve developed a new type of robotic system – particle robots – inspired by the behaviors of biological cells. Is the development of particle robots a step towards futuristic gray goo, that is, robots comprised of billions of nanoparticles? Maybe. The researchers say they have in mind robots that could explore new terrains, or clean up polluted areas. They announced their new concept on March 20, 2019. The associated peer-reviewed paper was published in the journal Nature on the same day. 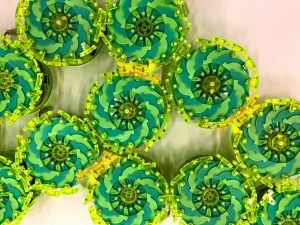 As the name suggests, these robots are composed of “particles” – individual and identical disc-shaped units, loosely connected by magnets around their perimeters. The particles can only expand and contract; that doesn’t sound sound like much, but when their motions are carefully timed, they push and pull on each other in a coordinated, smooth movement.